Pasta is a classic catering choice that people across the world love. A good Singapore catering company should feature at least one pasta dish in its buffet offerings. Pasta is incredibly versatile – it can be healthy, it can be decadent, it can appeal to meat lovers or vegetarians. 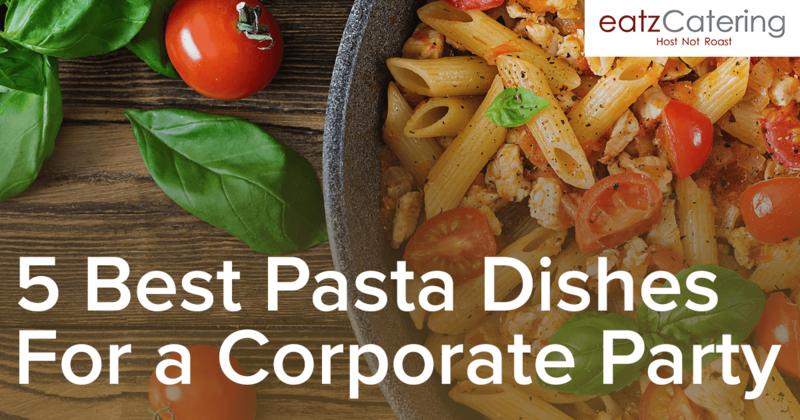 Choosing the right pasta dish for a corporate event will depend on several considerations. The first one is the type of the event. Will there be a seated arrangement or will the guests walk around and socialise with each other? The level of menu sophistication is also important. Do you want to opt for premium ingredients or something a bit more accessible and widespread? Once you answer these questions, you can choose the types of pasta dishes for a catered corporate event in Singapore. To provide a bit of inspiration, we’ve created a list of some classic and exceptionally popular pasta offerings. Some of the simplest recipes are the best ones. The quality of the ingredients shines through to produce a wonderful flavour profile that doesn’t have to rely on culinary gimmicks. Spaghetti aglio olio is one such ideal recipe for a corporate catered event. Spaghetti aglio olio is the most traditional of Italian recipes. The recipe from Naples features an oil-based sauce with garlic, finely chopped parsley and optional chili flakes. Grated parmesan or pecorino will be added on top for a stronger flavour profile. This wonderfully simple and elegant recipe is a part of the Eatz Catering International Buffet offering. It is a safe and delicious choice that most of the attendees will be familiar and comfortable with. Good corporate catering options should account for the preferences of health-conscious attendees. Pasta has a bad reputation for being a fattening choice that isn’t particularly healthy. The good news is that the range of available ingredients has become pretty diversified. Today, many options exist for the creation of traditional pasta dishes that feature healthy replacements for traditional white flour pasta. Whole-wheat and wholegrain pasta varieties are an excellent choice. They’re delicious and filled with lots of fibre, nutrients and minerals. Wholegrain pasta varieties allow for the same level of versatility as the standard choices. The Eatz Catering vegetarian whole-wheat vermicelli with mock char siew from the Healthier Choice Buffet is just one example. Are you looking for something a bit more exquisite and decadent? Pasta and seafood is a classic combination and there are dozens of recipes out there. Clams, mussels, prawns, octopus and various kinds of fish can be added as a delicious topping to spaghetti, linguine, fusilli, spaghettini , noodles and capellini. Experienced chefs can make their own variations of the theme, giving a modern twist to a classic recipe. This way, your corporate buffet will shine with a bit of originality and modernity. Let’s go back to classics – spaghetti Bolognese (or any other type of Bolognese pasta for that matter) is an option that simply can’t be left out of the list. The Bolognese sauce is probably the mother sauce of all Italian cuisine. The meat and tomato based sauce carries the name of the place where it originated – Bologna in Italy. Known as ragu alla Bolognese in Italy, this sauce typically features ground beef, soffritto, tomato paste and fresh tomatoes. According to historic documents, the earliest Bolognese sauce recipe dates back to the 18th century and it was presented in a cook book published back in 1891. The sauce is traditionally associated with tagliatelle and lasagne but culinary experiments allow for its addition to other types of pasta. The standard base for the sauce can also be modified by replacing one of the basic ingredients for an alternative. Chicken instead of beef makes it lighter and more suitable for serving to a health-conscious crowd. If you want to test out a modern spaghetti Bolognese spin for your next catered corporate event, try the spaghetti Bolognese with chicken in the Eatz Catering International Buffets menu. The addition of the simple, zesty pesto sauce makes corporate buffet pasta entries a great choice for vegetarians. The pesto sauce is another classic that has a well-established recipe but that can easily be modernised. Pesto alla Genovese is the original that originated in Genoa. This sauce is based on basil, garlic, oil, pine nuts and a grated hard cheese like parmesan. This is probably one of the oldest sauces out there. Some historic records suggest that pesto dates back to the time of the Roman Empire. The paste was called moretum at the time and it features various kinds of herbs, oil, garlic and vinegar. Basil became a primary pesto ingredient in the 19th century. Pesto is traditionally served with mandilli de sæa pasta but there are dozens of variations. To make the recipe richer, some chefs combine pesto pasta with various types of fish, salmon being a common choice. A nice balance of flavour is achieved through the addition of the fatty fish to the basic, clean pasta dish. These are just a few common, popular opportunities but the world of pasta is much more diversified and colourful than that. There are vegan creamy mushroom pasta recipes, garlic lemon prawn pasta, noodles, risotto, artichoke and sun dried tomato pasta, asparagus and ricotta pasta and many others. What matters is finding the right corporate company that can easily execute a classic or take the traditional recipe to the next level through a bolder and more daring interpretation. Companies like Eatz Catering have extensive experience with international cuisine and Italian staples. This is the main reason why multiple pasta variations are included in various Eatz Catering menus. If you are looking for a delicious and hearty pasta dish for corporate event catering, you should contact the Eatz Catering team today.